I spy with my little eye... Dubai sun, Friend and Foe. As you probably noticed if you follow me on instagram or twitter, I am back in Dubai! And back on my usual bipolar relationship with the sun: I can't live without the light and warmth, but I also like the idea of not looking like a overripe peach at age 40, and I always find that pale skin tone works better with red lipstick, call me Snow White. The answer to this universal dilemna as Baz Luhrmann puts it, is sunscreen. And I was lucky enough that it came with my August Glambox: two 100 spf Bioderma testers that are fantastic. Non greasy, transparent, easy to apply and with maximum protection. 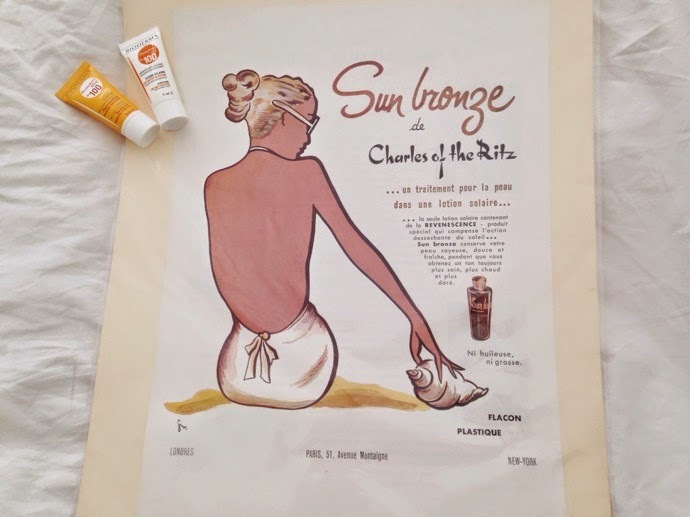 Like this 1956 french sun lotion ad mentions it, after Coco Chanel started the sun-kissed trend in 1920 (after she got sun burnt on the french Riviera, true story), it is important to hydrate your skin as well as protect it while sunbathing. And one more thing I can confirm after years in the desert: the spf degree has nothing to do with how much you will tan, just how much you will burn. Wear sunscreen!